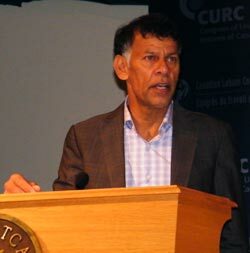 The Canadian Labour Congress needs CURC’s help to win the fight for better pensions, and won’t give up until the fight is won, CLC Secretary-Treasurer Hassan Yussuff told more than 100 delegates to CURC’s 10th Constitutional Convention. “We’re not going to stop until we have a commitment from the feds and the provinces to improve the pension system,” he said. The CLC’s three-year-old Retirement Security for Everyone! campaign has been “tremendous,” he said. Improving to the Canada Pension Plan (CPP) is the best way to prevent poverty among seniors, he said. CURC’s role in the fight will be a major one, because “no other seniors’ organization is as effective as CURC. “Seniors, whether we like it or not, are going to determine the future of every generation in this country. Seniors also vote – over 90% in many locations. Yussuff pointed out that there are 750,000 union members who are 55 years of age or older. He said this is “a golden opportunity” to build a strong movement for seniors. He urged delegates to keep up the work of building local area councils and provincial federations, building CURC from the ground up. He said he was confident the CLC campaign, which seeks to double CPP benefits over a period of time, would be successful. “There is support in the federal Cabinet. The one guy not onside is the Prime Minister.” He said the campaign had also received the support of nine of 10 provinces.